← Just When You Thought Democrats Couldn’t Possibly Get Any Stupider …. 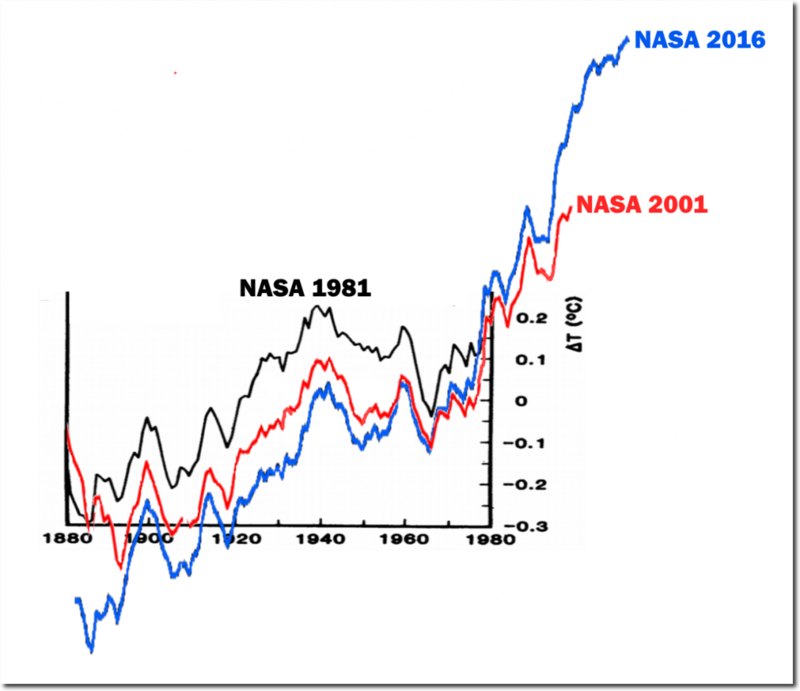 NASA’s surface temperatures have been steadily altered over time to cool pre-1970 temperatures, and warm post-1970 temperatures. This creates the appearance of warming, which is necessary to keep government grants coming in to the agency. 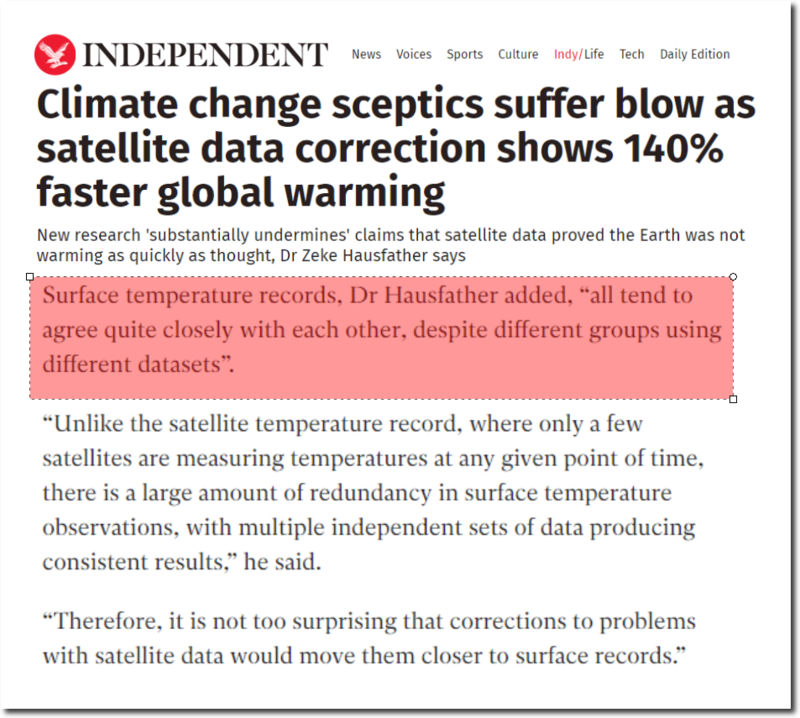 During March of 2015, I predicted that Carl Mears at RSS, under extreme pressure from the climate mafia, would alter his satellite data to match the fraudulent NASA surface temperature data sets. And that is exactly what happened. I captured this image about a year ago, which showed that both satellite data sets (RSS and UAH) closely matched, and diverged sharply from NASA’s surface temperatures. This is the current version of the same graph. 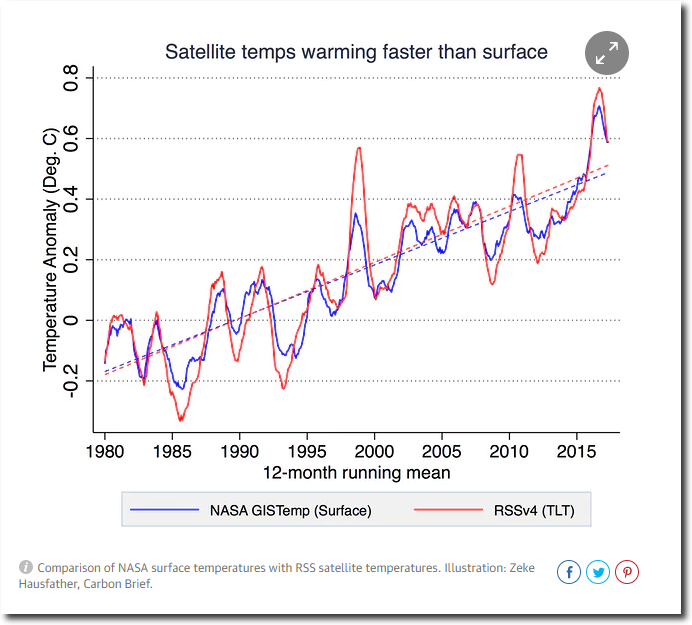 The RSS satellite data has been tampered with to make it match the NASA surface data. 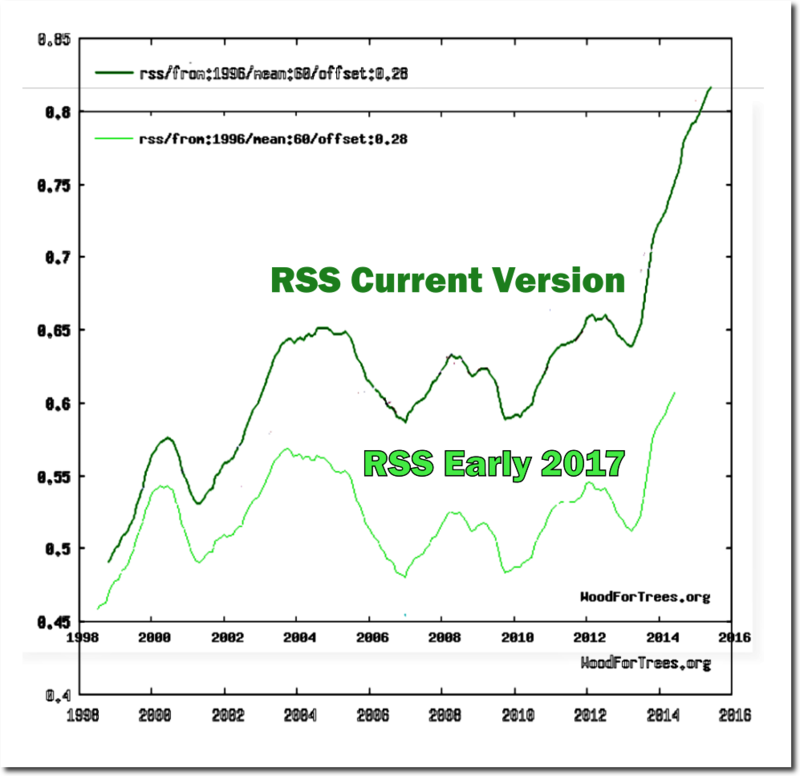 The next graph shows the changes to the RSS satellite data since early last year. The only two people who were qualified to review this data tampering by RSS, Dr. Roy Spencer and Dr. John Christy, were not consulted and the changes were not submitted for peer review to them. Here were Dr. Spencer’s predictions from January, 2017. Global warming is the biggest scam in history, and the only climate forecast that is reliable is that climate scientists will do whatever they have to to keep their funding coming in. Imagine weather/climate would become as predictable as AGW scientists. about their own ever increasing corruption as global warming hockey stick- once you know how an automaton works it is easy to predict. And this won’t change as long as these people get paid to have a very specific opinion. Just how long can this corruption go on?!!! They are becoming increasingly brazen and shameless. Trump has been in for over a year now and still this section of the swamp has not been drained. PDJT’s MAGA approach is unlike anything ever seen before in our lifetimes. There are many trillions of dollars at stake in keeping everything going as it had before. (Downhill and ever faster too). PDJT has many many enemies, and far too few friends, other than us deplorables. There is corruption deep within nearly every government agency and many who would like nothing better than to remove PDJT from office one way or another. Interesting things could happen as early as the state of the union address, but certainly before the next general election. But don’t worry too much. The more brazen and extreme the tampering, the easier it will be to prove malfeasance later when the time is right. Tony .. this is absolutely STUNNING! OMG! .. the blatant audacity! .. we need to spread this information far and wide! I remember that later, after that prediction, you also said they were starting to fool with the Radiosonde data. Any news on the status of that? They’re hardly the only two qualified reviewers, Po-Chedley and Fu who along with Mears were among those who pointed out the errors in Christy and Spencer’s original product would obviously be suitable. A paper on TLT following the already published paper on TMT would obviously be expected, since it also suffers from similar problems. In fact it had been submitted to the journal in Oct 2016 before Spencer’s prediction. It took the usual time to get through review, online version out in about a year. They were postdictions not predictions. 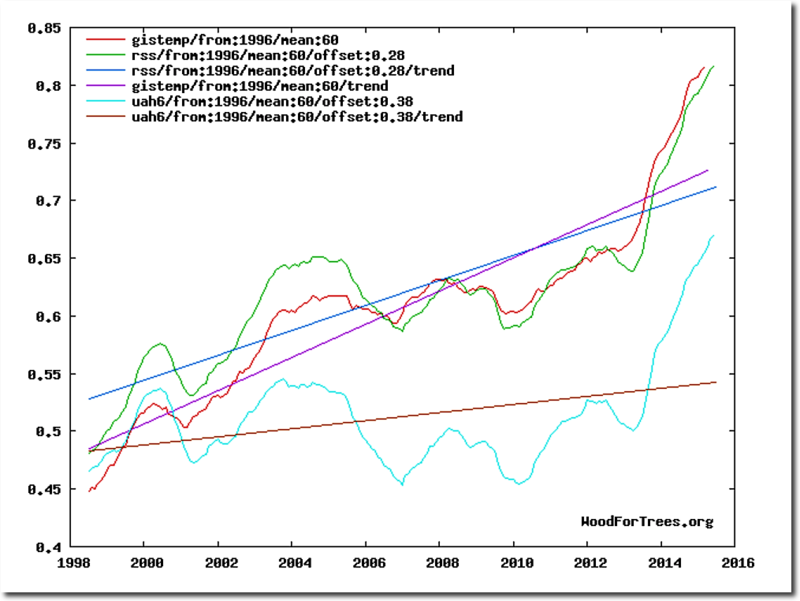 Mears altered his data to match GISS, which had been previously altered to match theory. Utter garbage and junk science. Remotely sensed data must be verified by in situ observations, the problem is that those observations have now been altered. So now we are adjusting actual data to fit biased artifacts of analysis. No he didn’t, he did exactly what Christy and Spencer did, correct for satellite drift. The method used was completely described in their paper, nothing to do with GISS. First Karlization, and now Mearsation. Warmunists never seem to realize that skeptics have good memories and know how to screen capture. The most egregious example is NOAA’s switch in early 2014 from Drd964x to nClimDiv for state by state reporting. Used California, Michigan, and Maine as examples in essay When Data Isnt in ebook Blowing Smoke. There is little difference between the educated clergy of the monarchies who provided credence the the king’s right to rule by divine providence so that they could share in the plunder from the peasants and the government sponsored climate scientists. Their belief system is so persuasive that one would have an easier time arguing the veracity of the virgin birth with an Evangelical than disagree with anthropogenic CO2 warming. Great one, Tony. Nails them to the wall. Who could argue it?